Proteins are a class of nutrients composed of amino acids, smaller molecules made of carbon, hydrogen, oxygen and nitrogen atoms. These atoms mix up in different patterns to make different amino acids. Some of them are essential because they can not be made by the body and must be taken in through diet. The rest of them can be made by the liver if all the necessary chemical components are available. Proteins have a variety of very important functions within the body. 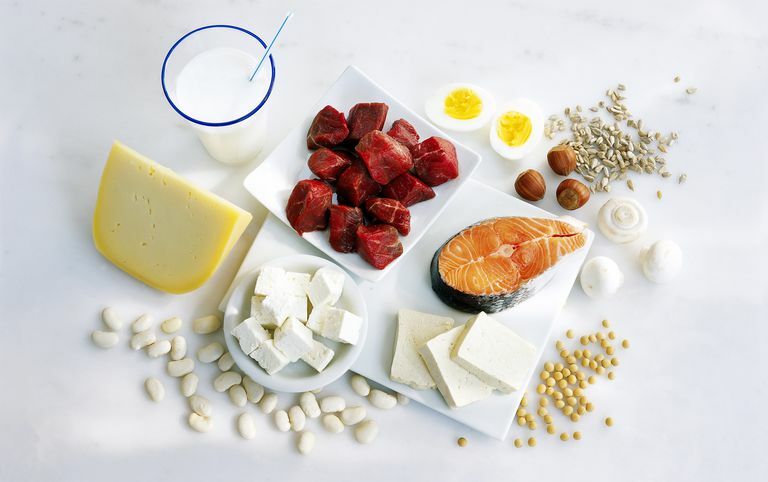 First and foremost, proteins are responsible for growth and maintenance of all body cells and structures, like bone, muscle, blood cells, skin and hair. They are also the primary component of enzymes, proteins which help facilitate many of the chemical reactions within the body, including digestion. Proteins are also integral in the production of hormones like insulin, thyroid hormones, estrogen, and testosterone. When we eat proteins in our diet, the stomach secretes digestive acids that begin the process of breaking down the chemical structure. Digestion continues in the small intestine where, in fact, a majority of protein breakdown takes place. Eventually, the proteins are reverted back to their basic amino acid structure so they can be absorbed through the intestine and into the bloodstream. From there, they go to the liver where amino acid use is regulated. Sometimes they are used to synthesize important proteins in the liver, sometimes they are sent elsewhere to be used. Protein requirements differ according to age, gender, and weight. However, for the average woman, aged 19 to 50, protein intake should be approximately 46g to 50g per day. A pregnant or lactating woman needs additional protein to meet their daily needs. A healthy PCOS diet should include at least 2 to 3 servings of lean protein each day. Protein in our diet can come from two different sources: plant-based (such as soy, nuts, and beans), or animal based (such as meat, dairy, and eggs). With the exception of soy, only animal-based proteins contain all of the essential amino acids in sufficient amounts. Plant-based proteins also contain all of the essential amino acids, however, some of them may be in insufficient amounts to meet our dietary requirements. If you do not eat animal-based products, you can combine different types of plant proteins to ensure that you get all the amino acids that you need. Animal proteins tend to be higher in saturated fats, so those types of proteins should be limited. Lean proteins include chicken and turkey baked or grilled without the skin, beef with the fat trimmed off and fish. Beans and nuts are also good choices of plant-based proteins. Experiment with grains such as quinoa and kasha which are extremely high in protein. Dairy, especially milk and yogurt do contain protein but are also high in glycemic index. Consume these foods in moderation. These days, many choices are available for leaner proteins. Turkey bacon and egg whites can make a delicious breakfast. A turkey sandwich with low-fat cheese, tomato, and lettuce can be an excellent lunch. Just try a honey mustard dressing instead of mayonnaise. Keep in mind that preparation counts as well, lean chicken is a great choice, but opt for it grilled or baked instead of fried. With a little thought ahead of time, it can be easy to find tasty protein choices that are good for you.